During this year's Open Championship, Mercedes-Benz presented the "Mercedes-Benz Vision Golf Cart". Hundreds of golf as well as automobile fans took part in an international competition by submitting their ideas for a golf cart of the future. 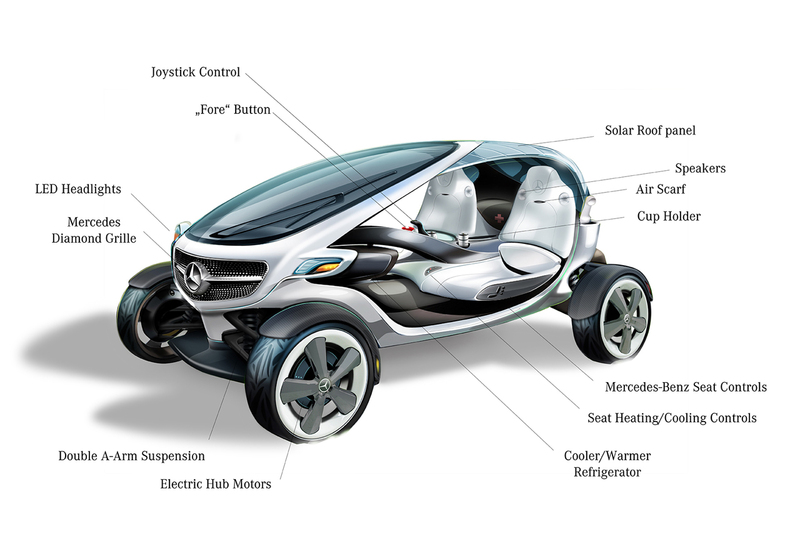 This invaluable input provided the basis for a visionary golf cart design study created by the Mercedes-Benz design department. As well as reflecting the innovative and forward-thinking ideas and wishes of golf players, the study includes the characteristics and technologies of a Mercedes-Benz. "The Mercedes-Benz Vision Golf Cart has a refined, simplified yet functional shape that fits well into our 'Sensual-Purity' design philosophy. The flow shapes create a 'sculpture on wheels' impression", says Gorden Wagener, Vice President Design Daimler AG. "I was very inspired by the idea of designing a golf cart, giving it a new shape and new sorts of meaning. Why not treating a golf cart like a car, and making it a 'Golf Car'". 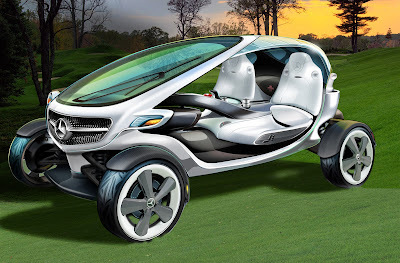 Earlier this year, Mercedes-Benz called upon golf and automobile fans from around the world to submit their ideas for a Mercedes-Benz golf cart of the future. So began the search to find the best, most unusual, most innovative and most promising concepts. A jury chaired by Gorden Wagener then selected the best entries from among all the submissions. The winners received an exclusive invitation as VIP guests to the Open Championship. Building on the basis provided by these ideas and concepts, and due consideration to the Mercedes-Benz design strategy, the Mercedes-Benz Advanced Design Center in Carlsbad, California, developed the Mercedes-Benz Vision Golf Cart. The cart combines the aspects of Mercedes-Benz vehicles with the functionality of a golf cart. The diamond grille, for instance, was incorporated to give the cart a modern face that is unmistakably a Mercedes-Benz. The idea of the competition was enthusiastically taken up by golfers from all over the world like Japan, South Africa and Germany, as well as North- and South America. The most frequently mentioned ideas and requirements were then incorporated into the design study that has now been presented. The Mercedes-Benz Vision Golf Cart and its innovative features The Mercedes-Benz Vision Golf Cart is electric driven, powered by a battery that is kept continuously charged by a solar module integrated into the roof. Manual charging, as for a conventional golf cart, is also possible. The vehicle is controlled in innovative and intuitive fashion via a joystick mounted on the centre console, so making it possible for either passenger to drive the golf cart. "It has the latest in modern technology. Using touch screen monitors, virtually all aspects of the cart can be controlled without extra buttons. Simplicity is the key. Intuition and pure form can maybe best describe the cart", says Margarete Wies, Head of the Mercedes-Benz Advanced Design Center in Carlsbad, California. The centre console also incorporates a multimedia panel that includes a rotatable docking station for an iPad or iPhone and a USB interface. Various functions that are available in the golf cart can be controlled from here, for example vehicle functions such as loudspeakers or the air-conditioning system, the head-up display, the music system or communication with the clubhouse and other golf carts. If so required the head-up display integrated into the windscreen can also be used, when the golf cart is stationary, to show the course layout, the current status of the game or weather information. The digital speedometer is placed beneath the windscreen. One wish that came up time and time again, irrespective of country or language, was the possibility of being able to use a telephone. The cart thus also features Bluetooth, so allowing telephone calls to be made via the loudspeaker system while on the move. An important issue is connectivity. Due to the iPad/iPhone connection to the cart it is possible to communicate directly with the golf club, for example to order drinks or food for the halfway catering. Current weather data and rain radars are available at any time. Working people have the possibility to write e-mails. In addition, users can share the digital score card or even photos from the golf game directly on social media channels. The so-called "fore button" can be used to quickly warn other players of a misplaced shot. Pressing this button sends a warning to all other golf carts within the danger zone so that they, too, can issue a warning signal. The interior takes its cues from the design of a Mercedes-Benz car. The elegant and ergonomically shaped seats, for example, are heated as well as ventilated and can be adjusted electronically using the Mercedes-typical controls on the side of the seat. The AIRSCARF neck-level heating system, first introduced in 2011 in the new SLK Roadster, is also envisaged as a feature of the Mercedes-Benz Vision Golf Cart. AIRSCARF, as its name suggests, wraps the neck and shoulder area in warm air, so making it possible to drive the vehicle open, even in cooler weather. There is also an integrated air-conditioning system, so ensuring a pleasant ambience even on a very hot or cold day. The optional lightweight doors are another special feature. A click-in function allows these to be very simply fitted if the weather is not so good, so providing protection against wind and rain. A retractable lightning rod is included for added safety in case storm clouds start to gather. In bright conditions the windscreen can be darkened at the touch of a button, while it also features windscreen wipers with rain sensors, thus ensuring that they activate as soon as it starts to rain. In addition, the space behind the seats is ideal for stowing umbrellas. One very commonly expressed request from the international entrants to the competition was, quite simply, to have plenty of stowage space. The Mercedes-Benz Vision Golf Cart therefore includes a whole range of stowage facilities. As well as the trunk compartment underneath the stowage area for the two golf bags, there are two dashboard compartments. The centre console is also specially designed to accommodate golf balls and scorecards and have a sun glasses storage. There is a small fridge fitted beneath the centre console, while cup holders between the seats will keep drinks hot or cold. An illuminated vanity mirror was another request, from female participants in particular, and is located at eye-height for the drivers. In addition to its use on the golf course, the golf cart is also able to run on normal roads. The designers have, for example, also included all the vital features such as indicators, headlamps and tail lights. Thanks to the LED headlamps, play can also continue when the light starts to fail, as they include a floodlight function. Although the Mercedes-Benz Vision Golf Cart is only a design study so far, there are no doubt many players who would like to see the cart become reality, bringing its fresh ideas and thus more fun, more innovation and more comfort to moving around on the golf course.